With his upcoming presentation at the eMetrics Summit in San Francisco, we interviewed Gary Angel, Partner at EY. Widely considered one of the leading digital measurement experts in the world, Gary leads EY’s Digital Analytics Practice. Pick the brain of Gary Angel as he shares his experience in digital analytics in the interview below. Q. Where does digital analytics sit in your organization and how does it interface with your business units? Gary Angel: We’re a consulting company, but the answer is still potentially interesting. We (the Digital Analytics Center of Excellence) are part of a very large Advanced Analytics and Information Management Team. That gives us direct access to a broad range of data scientists and statistics experts as well as a team focused on more traditional IT issues around MDM, governance, and transformation. Given the increasing reliance in digital analytics on big data solutions, that’s proven to be very useful. Q. What’s the most valuable thing you’ve learned from 2014 or in 2015 thus far? What’s the most important goal/trend for digital analysts to keep in mind in 2015? Gary Angel: Hadoop analytics is hard. It’s hard because the platform is immature and, frankly, the appropriate analytics techniques aren’t well explored. We’re all still learning how to make sense of this data in a more sophisticated fashion. I don’t think most people yet appreciate how inappropriate or inadequate many traditional stats techniques are for understanding digital data. I’m still waiting for the personalization Tsunami. Digital is, in my view, a direct response channel. It rewards personalization and if you think about the sites that really matter you’ll see that almost all of them have found ways to deeply personalize the experience. Most companies are nowhere near that – and re-thinking the multi-channel experience to be more segmented, diverse, and personal is the key to competitive advantage. It also happens to be one of the best uses for the kind of big data analytics mentioned above. Q. What’s the latest analytics method/process/tool set that you have implemented and what advice would you give others? Gary Angel: There isn’t much we haven’t tried. Domo is certainly starting to show up in the marketplace a lot more. Various flavors of Hadoop and the supporting technology stack continue to grow. I think one interesting trend here is that people are beginning to realize how big a part ETL is of the Hadoop environment/strategy. I’m starting to see a new generation of Hadoop targeted ETL tools that are potentially huge for analysts leveraging these new big data systems. Q. What sort of attribution model are you using to allocate marketing funds? Gary Angel: We’ve become strong proponents of a two-stage attribution model that focuses first on measuring lift. Assignment of credit inside lift is both more accurate and less problematic for the organization. Q. Sneak preview: Please tell us a take-away that you will provide during your talk at the eMetrics Summit. Gary Angel: Part of the presentation (the part I’ve done before) focuses on an understanding of what big data really is. I try to debunk the IT based notion that big data is about the four V’s (Volume, Velocity, Variety, Veracity) and show how the data we think of as big data actually presents fundamentally different analysis challenges. In the 2nd part of the presentation, I’m going to highlight some high-level strategies for modeling digital data in an analytics warehouse. So I’m hoping people will walk away with a much better of idea not just of what big data is, but how digital data needs to be structured to give analysts a fighting chance to use it successfully. Catch a sneak peak of what Gary Angel will share at his presentation, Big Data Without the Hype. 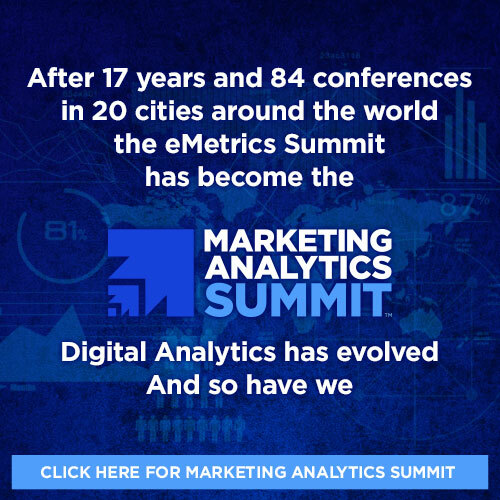 Don’t miss out on the eMetrics Summit in one month at the San Francisco Marriott Marquis, March 29th – April 2nd, 2015. Register today to enjoy pre-event pricing of up to $200!